Blending Balinese artistry with refined style for a global look, the style of this John Hardy necklace is suitable for all sartorial situations. 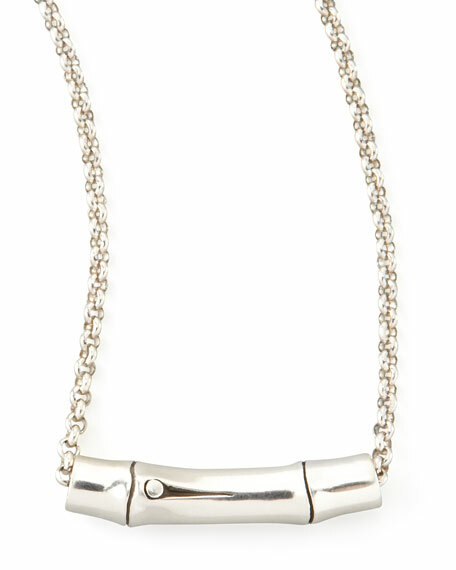 Rolo chain with lobster clasp. The Bamboo Collection is a tribute to the beauty, strength, and versatility of bamboo. John Hardy is one of the first companies to take a position on global warming tooffset the carbon emissions of its print advertising, business travel and electricity byplanting bamboo in Bali. For each piece sold from the bamboo collection, a number of bamboo seedlings will be planted by John Hardy. By wearing Bamboo consumers help plant bamboo and declare their commitment to style and sustainability. For in-store inquiries, use sku #2157964.